In Zusammenarbeit mit Tekbilek (Gesang, türkische Instrumente) und der Sydney Dance Company schuf Askill die dramatische (überwiegend perkussive) Musik zu einem Ballett, das die Geschichte von Johannes dem Täufer und Salome darstellt. Ergreifend! Michael Askill teams up with choreographer Graeme Murphy for a second dance production with The Sydney Dance Company. After the successful theatrical collaboration on Free Radicals, the pair was eager to continue the new direction of their respective arts and explore further the blurring boundaries between dancers and musiciansdance and music. The dark story of Salome, the infamous daughter of Kind Herod, has fascinated many for centuries. Her equally infamous dance with John the Baptist's head is the setting for the music composed by Michael. 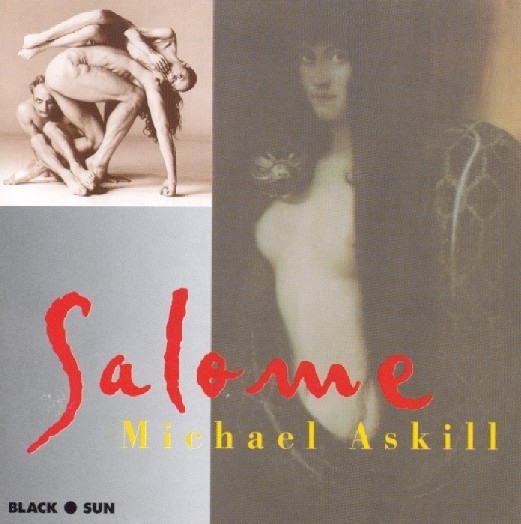 Salome is the original score for this evocative production featuring Michael Askill and percussionist David Hewitt playing a variety of bells, gongs and drums (on stage they are accompanied by the dancers) and pre-recorded pieces with Faruk's chanting which evoke a sensual, evocative atmosphere and combined create an ancient Middle Eastern ambience. Michael Askill has created a contemporary fusion of haunting vocals and mystical flutes with rhythms and percussion sounds inspired by the Middle East, Asia and Africa. Voice is used to symbolize John the Baptist while instruments represent the voice of the other characters, such as the ney flute for Salome, the zurna (a wild kind of oboe) for Herod, and the use of instruments for the drunken harem. Producer and composer Michael Askill is regarded by many as Australia's finest percussionist. He is a founding member and Artistic Director of Australia's premier contemporary ensemble Synergy, a composer, producer, and the former Head of the Percussion Department at the Canberra School of Music. He has collaborated with many master musicians in their own right such as Omar Faruk Tekbilek and David Hudson. Australian percussionist David Hewitt accompanies Michael Askill on this recording and in live performances. Turkish virtuoso Omar Faruk Tekbilek lends key musical and vocal elements which were recorded and intertwined into the live score performance. 2 Men's Dance with Herod 3'16"
3 Herod and Herodius: 4'44"
5 Soldier and Page 1'40"
8 Salome Demands to See John the Baptist 1'54"
9 John the Baptist and Salome 4'38"
10 The Soldier Kills the Page 1'46"
11 John's Compassion and Vision of Harmony 5'46"
13 Herod's Drunken Dance 1'53"
14 Herod's and Herodias' Argument 3'47"
15 "Salome, Dance for Me" 4'11"
18 Salome With the Head of John the Baptist 4'48"